guarantee head flower horn fish suppliers all over India . Packing forwarding by train 350 to 400 Rs per box. 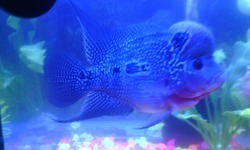 We are breeder and wholesaler of Flowerhorn Fishes. The Flowerhorn is a very hardy fish, and it is relative easy to rear. This fish is also known as Flower Horn, Lump Head Cichlid, Malaysia Rajah Cichlasoma. Flowerhorns were originally bred in the Central America and due to their size, they require large tanks, at least 300 Litres per 1 adult fish. With rich industry experience, we are presenting a broad range of Flower Horn Fish to our clients. These fishes are widely popular and are adored by pet lovers. The offered fishes are highly demanded for their beauty and attractive wings along with varied color combinations. Clients can avail these fishes at attractive prices. This is very beautiful fish. this fish hump is very good. fish varity is very good and hard. Flower Horn Fish, Size: 5"
Flowerhorn cichlids are ornamental aquarium fish noted for their vivid colors and the distinctively shaped heads for which they are named.